As we celebrate the Festival of Sukkot סֻּכּוֹת (Feast of Tabernacles or Booths), we complete the annual Biblical cycle of the feasts (called mo’adim in Hebrew) that occur in the fall. As an agricultural festival, Sukkot marks the end of the harvest time and is therefore called the “Feast of Ingathering at the year’s end” (Exodus 34:22) Sukkot is the original ‘Thanksgiving’ festival (minus the turkey, stuffing and pumpkin pie). It is celebrated for an entire week! Sukkot is one of the three pilgrimage festivals (Shloshah Regalim) where the people of Israel were commanded to appear before God at the Holy Temple. Sukkot is also a joyful remembrance of the goodness of God in providing for our Israelite ancestors as they wandered around the Sinai wilderness for forty years before entering the Promised Land. After the somber, introspective time of Yom Tru’ah and Yom Kippur, Sukkot is a joyous celebration. The time of judgment has passed and we enter into the season of joy. In fact, Sukkot is the only feast in which God commanded His People to rejoice. During this festive season, we recall how God’s faithfulness provided for our people in the wilderness with daily manna. We also remember God’s kindness and mercy in leading and guiding the children of Israel in a pillar of cloud by day and protecting them with a pillar of fire by night. Therefore another name for Sukkot is “The Season of our Joy”. On the last night of the feast, a water drawing ceremony takes place in remembrance of that which used to take place in the Holy Temple. This ceremony, called ‘Simchat Beit Hasho’evah’, not only celebrates the hope of winter rains in Israel, but also symbolizes the future Messianic Redemption when the Spirit of God (symbolized by the water) will be poured out upon the nation of Israel. This will bring great joy! Even today, many Jewish people gather near the Western Wall to dance, sing and rejoice before the Lord. People fill the synagogues and streets with singing and dancing with tremendous joy until the wee hours of the morning. The Prophets tell us that a day will come when the exiles of Israel return to Zion, her streets will be filled with the sounds of joyful melodies; sorrow will disappear. Yeshua stood up on this final day of the Feast of Sukkot (Festival of Tabernacles), probably during the ceremony of the drawing of the water (Simchat Beit Ha’shoeva) and proclaimed Himself to be the source of Living Water. He invited all who were thirsty to come and drink – the water representing the Holy Spirit (Ruach Hakodesh). The Children of Israel were required to leave the comfort of their homes and to live in little shelters, tabernacles or booths (called ‘sukkot’), during the Feast Sukkot and to remember God’s salvation, goodness, and provision. Just as the Israelites dwelt in temporary dwellings (called Sukkot סֻּכּוֹת in Hebrew), so are we commanded to sit in a sukkah (booth) for this entire week. Right after Yom Kippur ends, most Jewish people in Israel and all over the world begin building a temporary huts or shelters with a covering of palm branches. A sukkah comes in many different styles and sizes and forms. The common denominator is that it must be temporary and fragile. The sukkah itself symbolizes God’s covering of protection over us even in times of trouble. This is especially comforting at this time when even terrorism and natural disasters are causing devastation & distress all over the world. These fruit and branches used to be waved before the Lord in the Holy Temple on Sukkot. 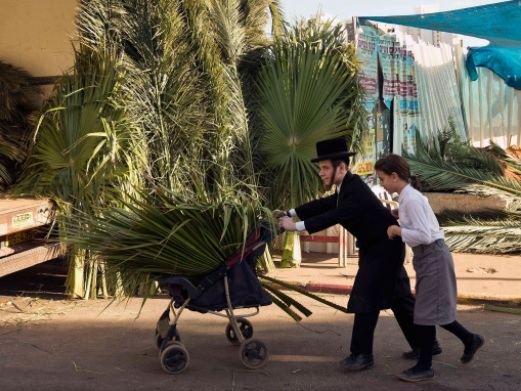 Today, they are waved in the sukkot and synagogues with a lulav (palm frond together with myrtle & willow branches) and etrog (citroen). Traditionally they are held together and waved in all six directions: right, left, forward, up, down and backward while reciting a traditional blessing for unity among all people from every nation.